Power Rating: Peak: 200 watts / RMS: 88 watts total. AM/FM tuner with 18FM/6AM presets. Supports Android OS 4.1 and above. 3-band parametric equalizer with 12 preset EQs+DRVN. 3.5mm Front Audio Aux Input. 2 Sets of 2.5V preamp outputs. Power Handling: Peak: 840 watts / RMS: 120 watts per pair. Recommended Power Range: 10 - 60 watts RMS per channel. Multilayer Mica Matrix Mid-woofer Cone Material. Cutout Dimensions: 8-3/4" x 6". Frequency Response: 28 -36,000 Hz. Power Handling: Peak: 640 watts / RMS: 100 watts per pair. Recommended Power Range: 10 - 50 watts RMS per channel. Length Of 50 Feet, 18-gauge wire. Connects audio speakers to your A/V receiver or amplifier. 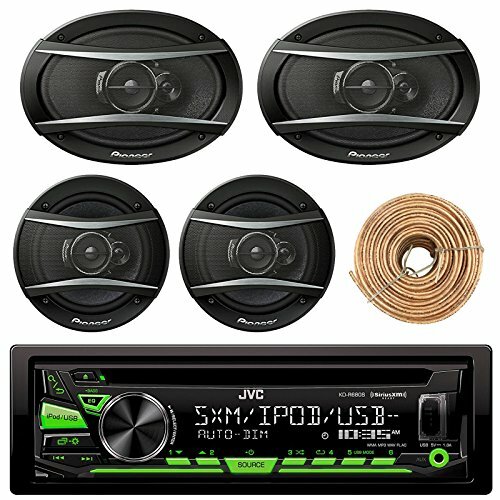 PRODUCT BUNDLE KIT INCLUDES: 1 JVC KD-R680S Single DIN In-Dash CD/AM/FM/ Car Stereo Receiver w/ Detachable Faceplate - 1 Set of 2 Pioneer TS-A1676R 320W 3-Way Audio Stereo Speaker - 1 Set of 2 Pioneer TS-A1685R 350W 6.5"/6.75" 4-Way A-Series Automobile Coaxial Speakers - 1 Enrock 50 Foot 18g Wire for speakers. STEREO UNIT: JVC's KD-R680S CD receiver includes a USB port to enable you to connect your iPhone® or AndroidTM so you can enjoy your favorite tunes. JVC rounds out this simple car stereo with a robust equalizer, preamp outputs for adding an amplifier, and a wireless remote for backseat control freaks, Connect your Android or iPhone to the KD-R680S's front-panel USB input, and you can control your music and charge your phone. 6.5" SPEAKERS: Pioneer's TS-A Series TS-A1676R 6-1/2" 3-way speakers give you a powerful sonic solution with a friendly price tag so that you don't go over budget building a whole system. Pair these puppies with a new car stereo for a refreshing sonic upgrade, or go all the way and power them with an outboard amp. Either way, these Pioneers will handle up to 50 watts RMS, so you'll have a high ceiling for cranking your jams. 6x9" SPEAKERS: Pioneer's pumped-up TS-A Series TS-A6966R 6"x9" 3-way speakers give you a powerful speaker solution with a friendly price tag so that you don't go over budget building a whole system. Pair these puppies with a new car stereo for a refreshing sonic upgrade, or go all the way and power them with an outboard amp. Either way, these Pioneers will handle up to 60 watts RMS, so you'll have a high ceiling for cranking your jams. SPEAKER WIRE: 50 Feet - 16 Gauge - The EnrockBasics Speaker Wire lets you easily do it yourself connect your speakers to to your audio equipment like receivers & amplifiers, Great for Cars, in-home, automotive, auditorium, school, church or business settings. If you have any questions about this product by EnrockAutomotiveBundle, contact us by completing and submitting the form below. If you are looking for a specif part number, please include it with your message.